Our goal is simple: To bring enthusiasts the aftermarket performance they need at a great price. We offer a constantly-growing and diverse assortment of quality hi-performance products that cater to all levels of interest. Whether you want to reach the finish line faster, or you're just looking to spiff-up your ride and save a buck, the Big End is where you want to be! Big End Performance Products are exclusively distributed by Meyer Distributing and VSI Performance Warehouse. 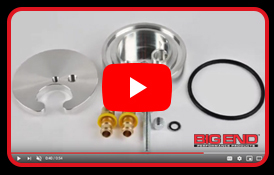 Call us today find out where to buy Big End products near you!